Paddlewheel Tournament April 26 and 27 – Register NOW ! 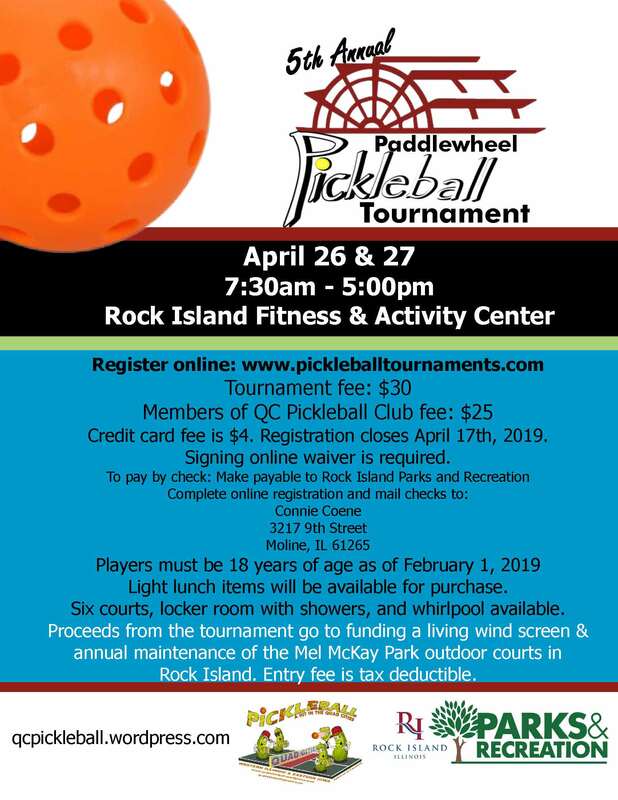 The 5th annual Paddlewheel on the Mississippi Tournament is coming up in Rock Island, Il on April 26 and 27. It is the same format as last year with Friday being a fun tournament where you do not have to bring a partner and will play a round robin with everyone in your skill level. Saturday is for skills 2.5 and above . Find out all the information on Pickleballtournaments.com. Easiest way to get there is go to tournaments by state and then scroll down to the tournament. Time is running out to register- April 17 th is deadline for registration and payment. Image | This entry was posted in News and tagged April, paddlewheel, Tournament. Bookmark the permalink. 2 Responses to Paddlewheel Tournament April 26 and 27 – Register NOW ! Carol. I registered for this but did not see that it was for 2.5 and above. I am a 2.0 player without a partner. I think I should drop out of Sat. Can i do that and still play Friday?